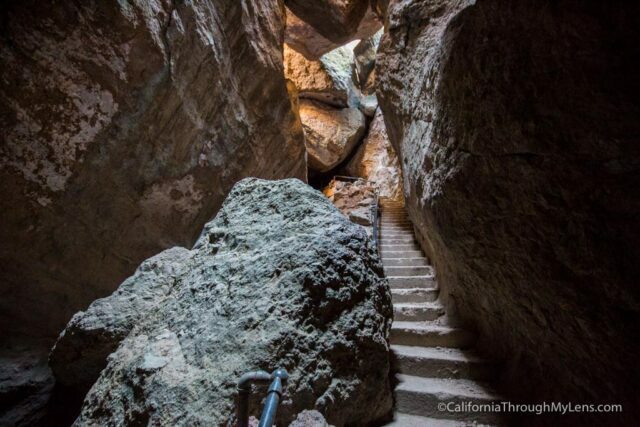 Pinnacles National Park is home to not one, but two unique caves; both of which are made by cave-ins and not by lava flow like most of the California caves are made by. I got a chance to explore Balconies Cave a couple of years ago but finally got to check off Bear Gulch Cave in 2016. This cave and hike are amazing; you really need to experience it for yourself. Here is all the information. 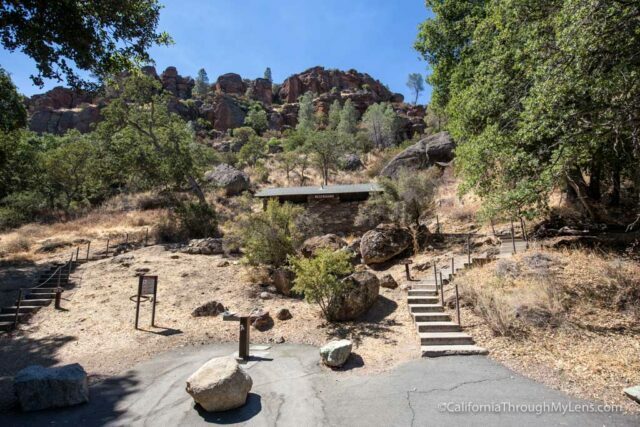 The hike to Bear Gulch Cave is accessed from the East entrance to the park (no roads through the park). 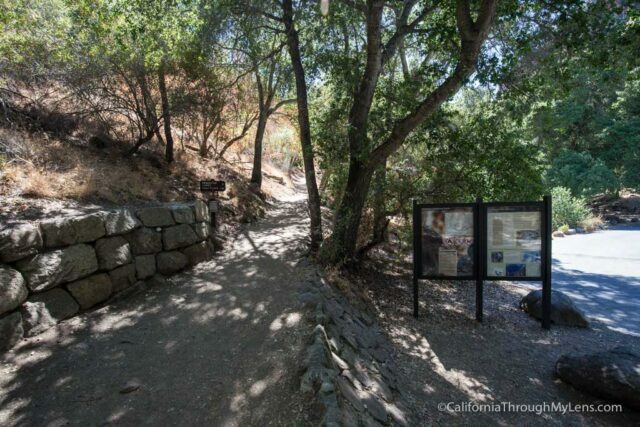 After paying your fee, you will enter the park and head to the Bear Gulch day use area. There are two small parking lots you can start from, so if one is full then try the other. This post is from the one the road dead ends on. When is the Cave Open? You can see the current status of the cave here. Do note that it is closed for a few months out of the year so check before you go. 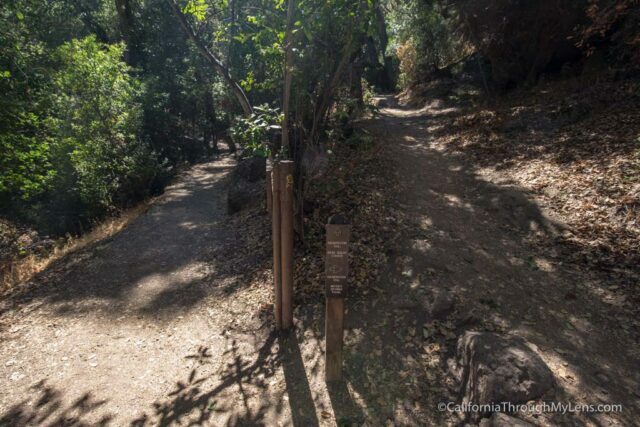 The trail to Bear Gulch starts from the parking lot, and there is a bathroom here if you need it before heading out. 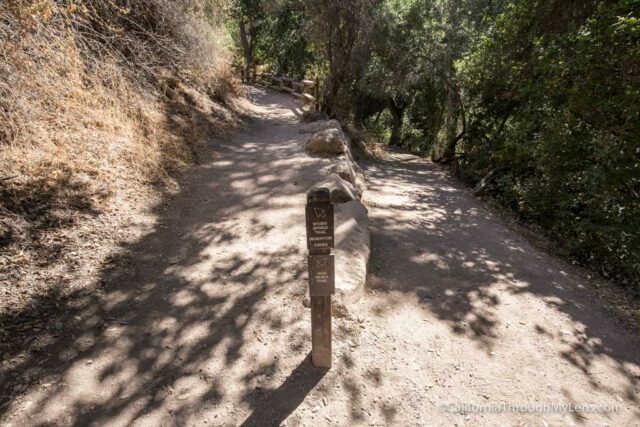 The trail proceeds up a gradual incline, and it is shaded, so that makes it much more pleasant on hot days. As you head up you will start to notice the change in the scenery around you, with the trees making way for large rocks. At about the quarter mile marker you will get to a small tunnel. I thought this was the start of the cave, but it is just a ten-foot tunnel, and you come out on the other side. 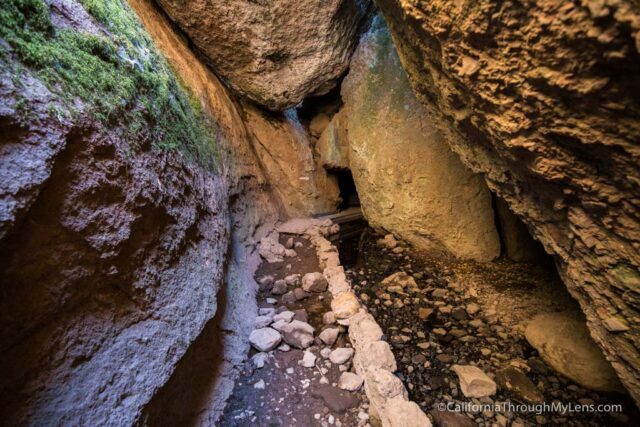 The trail continues its gradual climb, and you pass splits that take you around the cave when it isn’t open. 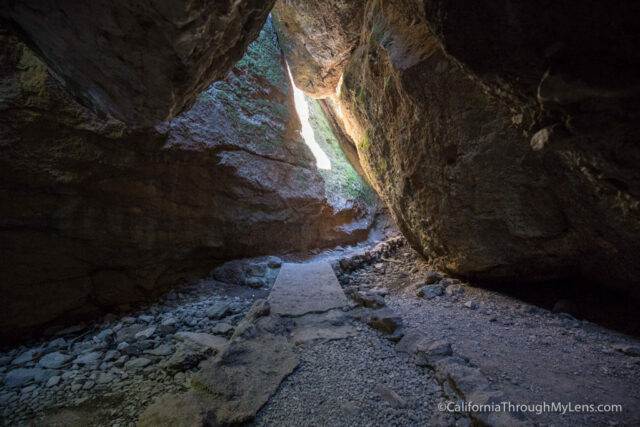 When you get to the cave entrance, you will see a massive rock in front of you and a sign that reminds you that you need a flashlight. I highly recommend you bring one as the iPhone light is not as bright as you would think in pitch darkness. 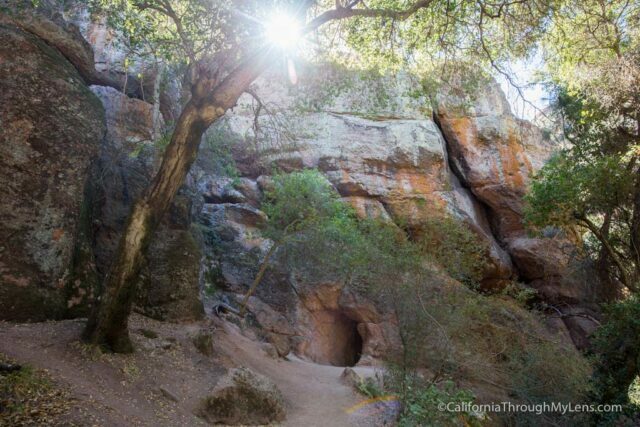 The cave bends around, in and out of light before you hit the staircase. 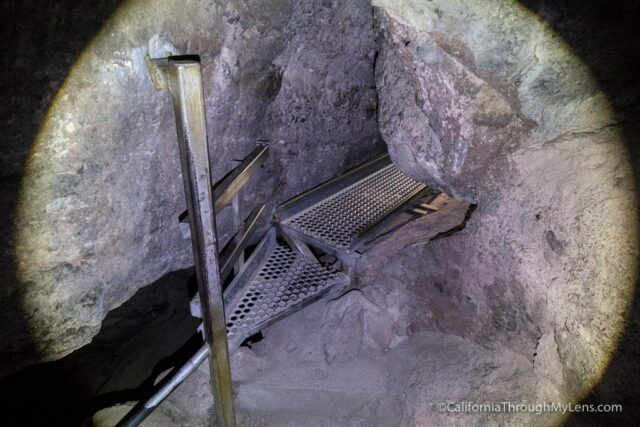 The stairs allow you to climb up and through the cave, you will be using them for most of the path through the cave. Each section of stairs you climb give you better views of the cave entrance behind you and an appreciation for the size of the cave. 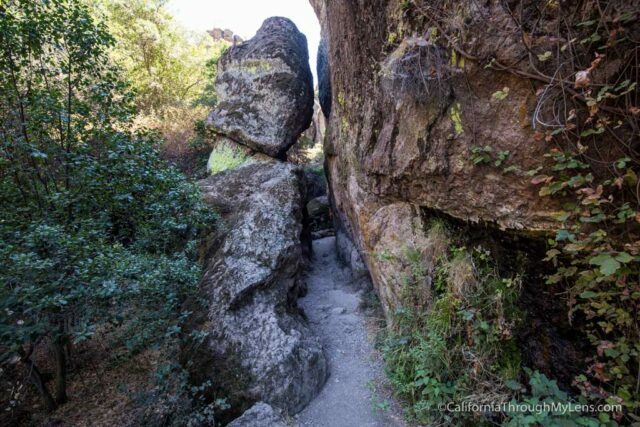 As you get near the top, there is one long staircase which is pretty narrow since the rock itself intrudes on the path. 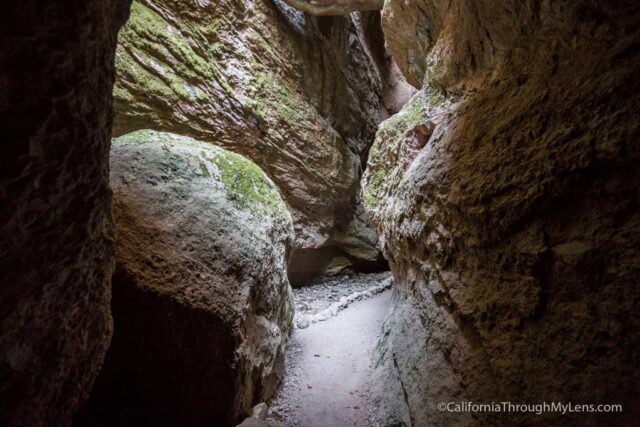 At the top, you will be in pitch darkness as you make your way over a series of rocks and to a split in the trail. One way takes you to the upper section, which was closed when I came and the other takes you out. 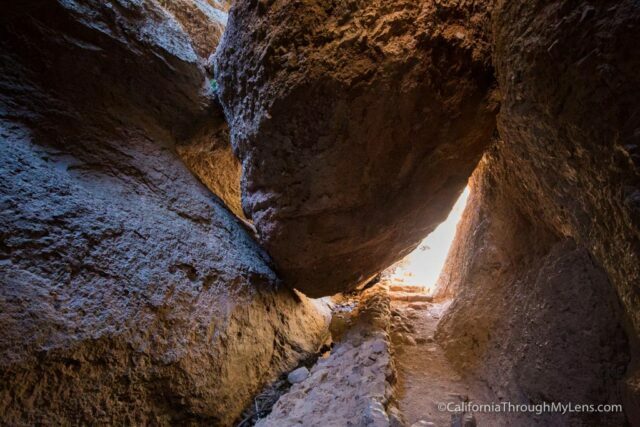 The trail out does require you to get down on your knees to get under a large rock. 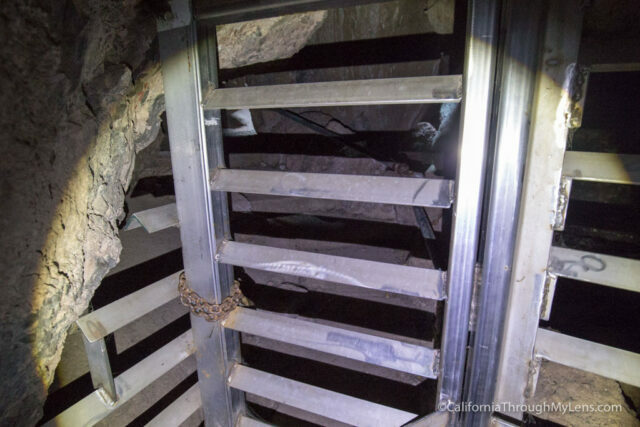 You then come out of the metal door and climb a set of stone stairs out of the cave. It is a little crazy at the end but just take your time, and I am sure you will be okay. 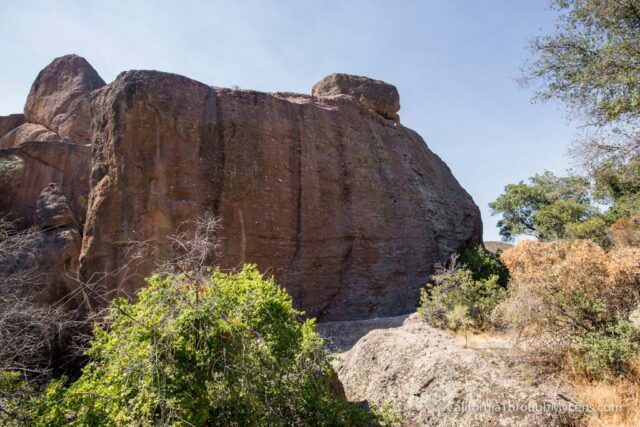 The trail then passes the Monolith (rock in the above picture) which is a very popular spot for climbing. 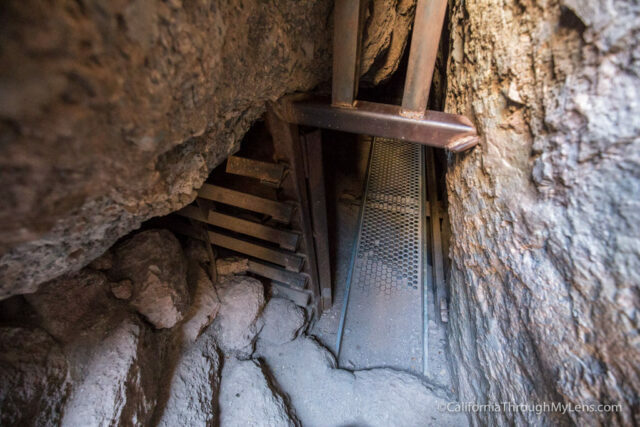 You then enter a cave like area where you will be ducking under rocks as you proceed down to the bottom. The bottom has a little water in it, letting you know you are close to the reservoir. This section was also really cool with the massive rock that was sitting there creating the opening for the door (above photo). 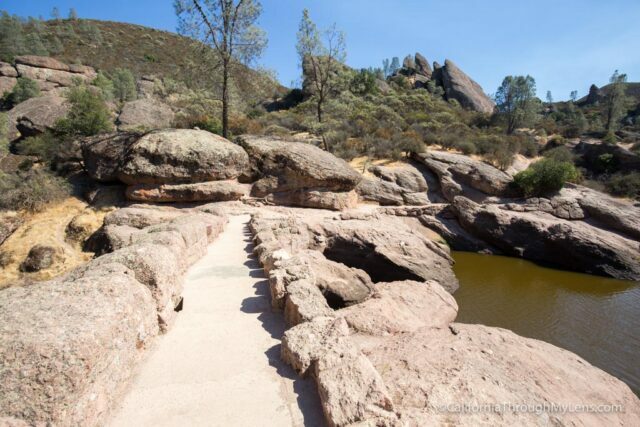 Outside of this bottom area, you will see a set of stairs carved into the rock on the right-hand side. 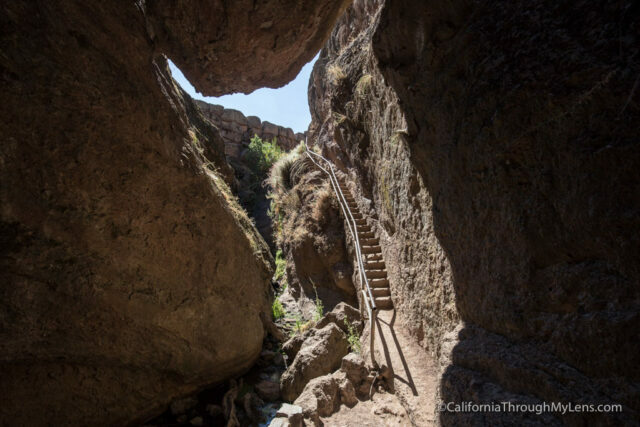 You will want to climb these, utilizing the handrail, and make your way out of the cave section to the reservoir. 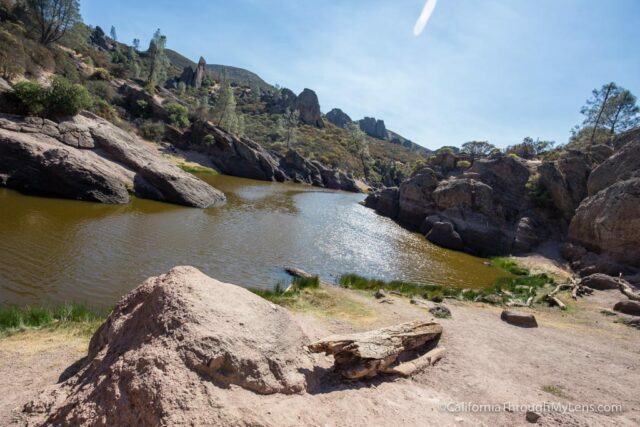 While the reservoir is not that big on its own, it is still a beautiful thing to find in this sparse desert known as Pinnacles National Park. I grabbed a seat on a rock and just sat and enjoyed it for a few minutes as I was one of the only people here. This is a great spot to bring some food and have a picnic as well. 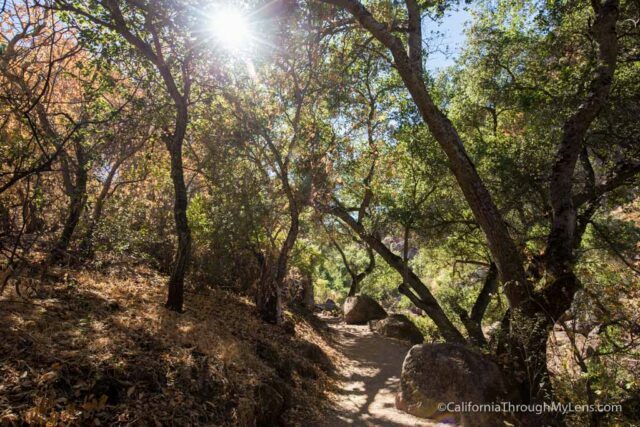 After taking your time to explore the reservoir you can head back the way you came or continue on the Rim Trail to the High Peaks. If you want to do that, then read on in this post, if not, leave a comment below and let me know what you thought of the cave.